Have you noticed how what starts as slang can completely alter the meaning of a word? Take the word unreal, for instance. Today, people often say unreal when they mean fantastic, astounding or much better than expected. The party my teenage daughters went to last night was "unreal." The new shopping area that opened near us has some "unreal" stores in it. The new ice cream made from 100 percent natural ingredients and guaranteed free of all artificial flavoring tastes — er, "unreal." Once when I was supervising a convention of members of the Worldwide Church of God, a hotel manager told me, "Your people are unreal." He meant that they were courteous, disciplined, polite, honest and friendly. They didn't get drunk or leave their rooms filthy, and their children didn't run rampant in the lobby, making life miserable for the other guests. The manager meant unreal as a compliment, and I thanked him. But unreal isn't always meant as a compliment. Many people today think that to live by the laws of God as written in the Bible is "unreal." To live life honestly in today's world, without trying to take unfair advantage of others, is impractical. They regard it as old-fashioned to take time out of a crowded schedule to pray, and downright ridiculous to set aside money out of a tight budget to tithe. True Christianity according to God's laws might look good on paper, but when it comes to living in the real world, it just can't be done. To be successful in that real world, you have to be willing to meet it on its own terms. "Out there" people and circumstances won't let you live a Christian life. The real world has become just like the apostle Paul said it would when he wrote: "But know this, that in the last days perilous times will come: For men will be lovers of themselves, lovers of money, boasters, proud, blasphemers, disobedient to parents, unthankful, unholy, unloving, unforgiving, slanderers, without self-control, brutal, despisers of good, traitors, headstrong, haughty, lovers of pleasure rather than lovers of God, having a form of godliness but denying its power" (II Timothy 3:1-4). Most people wish it could be different. They agree that if everyone would start living the way of giving, sharing and helping, life would be much better — fantastic — unreal. But you have to be practical, don't you? That way just doesn't work in today's real world, does it? Perhaps it is time we ask ourselves which is the real world, and which way of life is unreal. Let's forget for the moment the peculiar way we use the word unreal today and remind ourselves of its real meaning. My dictionary defines real as "genuine, true and authentic." So unreal must mean the opposite: "untrue, not authentic, forged, counterfeited, fraudulent." With those definitions, ask yourself: Is the world we live in today real or unreal? Look how this world began. Satan, whom the Bible describes as the god of this world (II Corinthians 4:4), put into action an elaborate lie shortly after the creation of the first humans. He seduced Adam and Eve by persuading them to disobey their real Creator and decide for themselves how they should live. Satan, in effect, kidnapped Adam and Eve. God then banished Adam and Eve from Eden, the garden He had planted to serve as an example of how life should really be lived. He also cut them off from His Holy Spirit, which would have given them knowledge of the real purpose of life. For nearly 6,000 years, Satan has led mankind farther and farther down the wrong path. He has deceived the whole world (Revelation 12:9) with a false way of life. Today, in spite of the incredible progress in physical areas, the human race has no idea why it exists or what its real purpose is. Instead, humans pursue artificial goals, false hopes and dreams that lead nowhere. Billions live out their lives as atheists, or steeped in the empty nonsense of paganism. Even the "Jesus" that so many millions worship is a counterfeit, and the gospel message that is so passionately preached is actually a perversion of the real message Jesus brought. Poor people. They want peace. People don't want to live in an armed camp, their future threatened with nuclear war. Nations would surely prefer to "beat their swords into plowshares." But they have to face "reality." They believe that the real world doesn't work like that. But is it a real world? It is not. This bewildered, selfish, ugly society that we live in today is not real at all. It is a forgery, a lie — a travesty of what life ought to be like. It is a society devised by a fraud who masquerades as God. There is nothing real about it. This world is a forgery. It is nonetheless a clever forgery, and most people cannot tell a forgery, unless they can compare it side by side with the real thing. Which brings me to the point. 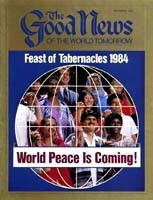 Many members of the Worldwide Church of God are now preparing to attend the Church's annual convention — the Feast of Tabernacles. For eight days, they go to one of more than 80 locations around the world to enjoy the companionship of people of like minds, and to be further instructed in living their lives God's way. Because they obey God's money laws, they are financially prepared. Because they have the Spirit of God, they are able to be at peace with themselves and with others. People who live in the areas where the Feast is kept are always impressed with the example the Church sets. That is as it should be. A real Christian should be a light to the world (Matthew 5:14). When you bring several thousand lights together, it makes quite a glow. A city set on a hill cannot be hid (same verse) — you see it a long way off. At the Feast sites, God's Church shows that human beings can live together in cooperation. They can be honest, generous and kind. Unselfishness does work. Giving does make people happy. It is as if, for a moment, the light of reality shines on Satan's shabby forgeries, exposing them for what they are. People see a different way of life, and although they may not understand it, they like the results. The Feast of Tabernacles is the largest convention of its kind in the world today, and it is hard to ignore it. It is a type of the 1,000-year reign of Jesus Christ, when people will finally learn the real purposes of God and experience life as it was meant to be. The Feast of Tabernacles is not unreal. It is actually a foretaste of reality. But the responsibility to be a light does not begin and end with the Feast of Tabernacles. It is a year-round responsibility for all Christians. "For you were once darkness, but now you are light in the Lord. Walk as children of light... and have no fellowship with the unfruitful works of darkness, but rather expose them," wrote the apostle Paul (Ephesians 5:8, 11). In other words, expose the forgery for what it is. That's easy to say and hard to do. This unreal world sometimes seems all too real. It's fairly easy at the Feast to do things right, because everyone is going in the same direction. The pressure is on to smile, be friendly, show compassion and courtesy, not to lose your temper or use bad language. Someone who did any of those things at the Feast would be exposed immediately as a fraud. But away from the Feast, it is different. That group pressure to do right is no longer there. In the unreal world that Satan has designed, the current is against you, and there is nothing unreal about that current. It has a strong pull, always threatening to carry you away, pull you under and extinguish your light. You must be willing to swim against it. Those who are going with the current may not appreciate what you are trying to do. They may laugh at you, persecute you, tell you that you are out of touch with reality. The pressure to compromise, to again accept Satan's counterfeit way of life, is strong. Satan, the deceptive god of this world, commands fanatical loyalty from those he has deceived. So convincing are his lies that there have been times when God's servants have been killed by "good, God-fearing people" who thought they were doing God a favor. The apostle Peter wrote that real Christians should have "your conduct honorable among the Gentiles, that when they speak against you as evildoers, they may, by your good works which they observe, glorify God in the day of visitation [when God calls them]" (I Peter 2:12). There is, therefore, a heavy responsibility on those whom God has called out of the unreal world to maintain their standards, not only when they are together at the Feast, but at all times. Jesus Christ lived a life that exposed the hypocrisy and corruption of the unreal world around Him for what it was. He told His true disciples to follow that example.